KAER™ Biotherapeutics provides new treatments for respiratory diseases through the inhalation of therapeutic aerosols using its proprietary SUPRAER™ technology. KAER’s technology delivers solid-phase fine particle aerosols generated from viscous solutions of high molecular weight drugs and suspensions. It can also be used to deliver high concentrations of sparsely soluble compounds. These inhaled therapeutics are delivered at a preselected size and at high dose rates, minimizing treatment times and improving clinical outcomes. KAER is developing aerosolized surfactant for the treatment of acute respiratory distress and works with pharmaceutical companies to deliver their proprietary agents. The company has a worldwide intellectual property portfolio 11 issued and 8 pending patents) for the generation, processing and delivery of aerosols for respiratory ailments. KAER™provides services and devices for the generation and delivery of respirable aerosols. KAER addresses the needs of the biopharmaceutical and toxicological industries. KAER’s SUPRAER™is a patented new class of aerosol delivery system. In this system, a large liquid aerosol is generated with a low-shear nozzle, dried, concentrated and delivered on demand. The dose rates are 5 to 30 times higher than current nebulizer technologies. SUPRAER extends the range of molecule, nanoparticles and organelles that can be aerosolized to form fine particle aerosols. These include, antibodies, antibody drug conjugates, fusion proteins, surfactants, oligonucleotides, cellular organelles, viruses and multi-walled carbon nanotubes (MWCNT's). KAER’s proprietary aerosol generation technologies are also applicable to the generation of aerosols of cells and cellular organelles. SUPRAER can also be used to generate nanoparticles and non-flammable vapors. ARDS and Need for a Viable Surfactant Treatment: Acute respiratory distress syndrome (ARDS) afflicts 10% of patients in intensive care (>200,000) with 40-60% mortality. Within 48 hours of a precipitating insult, patients develop multifocal airway collapse, edema and hypoxemia; each caused or aggravated by defective surfactant and its continued inflammation-induced degradation. Present treatment consists of life support with low tidal volume ventilation. A viable aerosol surfactant replacement therapy would reduce surface tension, open atelectatic airways and collapsed alveoli, and decrease the effort of breathing while improving oxygenation. A new life-saving therapy is made possible by the combination of surfactant together with its delivery at high dose rates using a new class of aerosol delivery system, SUPRAER®. Repeated aerosol surfactant therapy would treat the initial surfactant abnormalities as well as its continued degradation, leading to improved life support and patient survival. Surfactant Aerosol therapy for RDS. Of the 15 million premature babies born around the world, one million will die annually within the first month of life, and many of the 14 million survivors are faced with a lifetime of serious health complications. Respiratory distress syndrome, RDS, is the single most important cause of mortality and morbidity in preterm infants. In the case of neonatal respiratory distress, the surfactant deficiency is due to the lack of surfactant production in infants born prematurely and, as expected, the severity increases inversely proportional to gestational age. In near-term births meconium aspiration and pneumonia can further confound the clinical condition and its resolution. Both surfactant instillation into the lungs and continuous positive airway pressure, have been shown to improve outcomes in premature babies with RDS, however, the complication rate, comorbidities and mortality rate due to intubation remain high. To mitigate these adverse sequelae, this KAER is focusing on the development of non-invasive aerosol surfactant replacement therapy. Lung diseases that are being treated or destined to be treated with biotherapeutics include cancer, obstructive lung disease, asthma, cystic fibrosis, pulmonary fibrosis and pneumonSurfactant Aerosol therapy for RDS. Of the 15 million premature babies born around the world, one million will die annually within the first month of life, and many of the 14 million survivors are faced with a lifetime of serious health complications. Respiratory distress syndrome, RDS, is the single most important cause of mortality and morbidity in preterm infants. In the case of neonatal respiratory distress, the surfactant deficiency is due to the lack of surfactant production in infants born prematurely and, as expected, the severity increases inversely proportional to gestational age. In near-term births meconium aspiration and pneumonia can further confound the clinical condition and its resolution. Both surfactant instillation into the lungs and continuous positive airway pressure, have been shown to improve outcomes in premature babies with RDS, however, the complication rate, comorbidities and mortality rate due to intubation remain high. To mitigate these adverse sequelae, this KAER is focusing on the development of non-invasive aerosol surfactant replacement therapy. ia. The IV route is most often chosen because of the delivery limitations of present aerosol delivery systems. Intravenous administration not only has considerable patient resistance, but its own attendant complications. Given the high molecular weight of many of these agents, large doses are often required to achieve acceptable therapeutics levels. The treatment of lung diseases with such large masses (tens to hundreds of milligrams) of biotherapeutic aerosols has presented formidable technical challenges. The introduction of SUPRAER™ fulfills this need. KAER utilizes this SUPRAER platform technology to form partnerships with pharma to deliver their biotherapeutic directly to the lungs. Aerosol delivery via the respiratory tract is the preferred mode of administration for lung diseases. Intravenous administration may require 5 to 100 times the dose of that delivered directly to the lung via inhalation. The ability to rapidly deliver high doses of therapeutics to the lung via inhalation provides direct access to the target organ while markedly reducing the total dose of the agent, cost of therapy, as well as the potential for systemic side effects. It is notable that development of biologic agents comprise half of drugs in the pharmaceutical pipeline. These biotherapeutics include, proteins,fusion proteins, peptides, surfactants, oligonucleotides, antibodies,antibody drug conjugates, plasmids, vaccines and liposomes. In addition, there are other agents and large unstable molecules in which large masses are required to be deposited in the lungs for effective therapeutic results. New therapies could included the aerosol delivery of stem cells and cellular organelles. The delivery of tens to hundreds of milligrams of therapeutic agents presents formidable barriers and practical issues for present liquid or dry powder aerosol delivery systems. 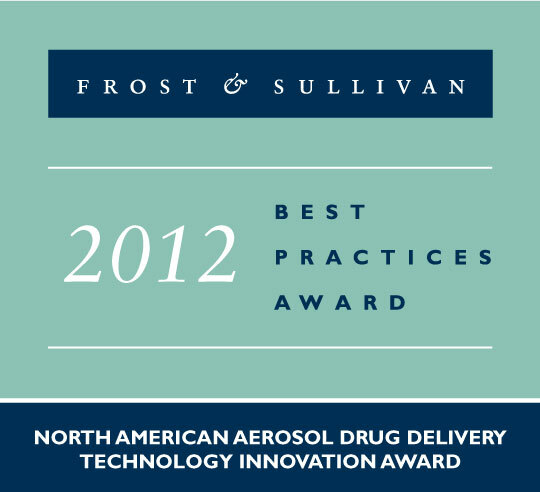 These issues include, low output with very long patient treatment times, structural and functional degradation of the active ingredient as well as the need to add large amounts of excipients to create suitable aerosols and maintain long-term stability. In addition, there can be considerable variation in the dose deposited in the lungs espcially in devices with low efficiency. Aerosols 2 to 4 micron MMAD can be delivered at rates of up to 30 fold higher than current nebulizers resulting in far shorter treatment times. High payloads of up to 2 g can be delivered. Molecular or functional degradation of aerosolized biologics has not been observed. Adoption of SUPRAER can result in improved patient care and lower healthcare costs. The short treatment times using SUPRAER initiates a positive cascade of benefits that flow through the healthcare chain and in turn drive biopharma's product sales. The paradigm change from intravenous (IV) to inhalation administration for lung disease treatments results in an 80% reduction of the dose of biotherapeutic administered. Patients experience shorter treatment times and fewer side effects along with improved efficacy and treatment adherence. Healthcare providers enjoy more effective utilization of resources and insurance agencies reduced costs. There is a sizable increase inthe number of patients that can be served by each manufacturing plant, resulting in a decrease in cost of goods and increased margins for pharma. Overall, this translates into better healthcare at a lower cost. To evaluate the toxicological effects of an inhaled drug or toxicant it is often desirable to delivery high concentrations of an aerosol in a short period of time. SUPRAER is a compact turn-key system that produces concentrated aerosols from solutions or sols of the test agent. SUPRAER is a very compact spray dryer that is ideal for spray drying very small quantities of valuable materials. SUPRAER incorporates low shear jet-type nozzles. This facilitates scalability.